The HT family of Linx remote controls is based on the DS Series encoder and decoder. The DS Series is completely compatible with the legacy Holtek® HT640 encoder and HT658 decoder that were used in previous generations of this family. Ten address lines allow for the creation of up to 1,022 unique addresses using DIP switches or cut traces. 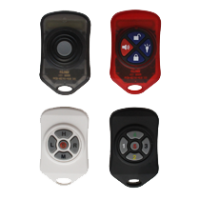 The HT Keyfob transmitter is ideal for general-purpose remote control and command applications requiring a small form factor transmitter. The small transmitter has a line of sight range of up to 750 feet (230m). It is available in 418 (standard) and 433.92MHz. It has been pre-certified for FCC Part 15, Industry Canada, and European CE (433MHz only) compliance, reducing costs and time to market. 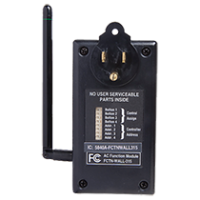 Turn a power supply on or off with a button press or contact closure by using the AC function module with a compatible Linx transmitter and Holtek encoder. Holtek chips provide a low level of security. They let you send commands from multiple transmitters to distinct receivers in the same vicinity through physical addressing. The AC function module contains a Holtek decoder and an LR Series receiver. It can be used with a KH2 Series transmitter/encoder or with a combination of a Holtek encoder and an LT Series, LR Series or LC Series RF module. Turn up to four electrical loads on or off with a button press or contact closure by using the relay function module with a compatible Linx transmitter and Holtek encoder. Holtek chips provide a low level of security. 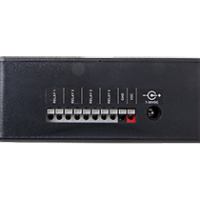 They let you send commands from multiple transmitters to distinct receivers in the same vicinity through physical addressing. The relay function module contains a Holtek decoder and an LR Series receiver. It can be used with a KH2 Series transmitter/encoder or with a combination of a Holtek encoder and an LT Series, LR Series or LC Series RF module.